Dr. Alfonso and staff were so kind and attentive. I finally have found a dentist I respect and trust. I highlyrecommend!!!! Best dental experience I have had since moving to South Florida! Dr. Alfonso and staff were so kind and attentive. I finally have found a dentist I respect and trust. I highly recommend!!!! Best dental experience I have had since moving toSouth Florida! Dr. Alfonso’s team is one of a kind . From the receptionist and everyone else at this office , everyone isvery pleasant and kind . I had an dental emergency that I flew in for and Dr. Alfonso took care of me right away . He reassured me with my questions and didn’t make me feel pressured or rushed . Took care of my problem with minimal pain. Definitely recommend ! Dr. Alfonso’s team is one of a kind . From the receptionist and everyone else at this office , everyone is very pleasant and kind . I had an dental emergencythat I flew in for and Dr. Alfonso took care of me right away . He reassured me with my questions and didn’t make me feel pressured or rushed . Took care of my problem with minimal pain. Definitely recommend ! Dr. Jossue Alfonso is a caring dentist treating patients in Greater Miami, FL. He is certified to administer nitrous, and he is certified in Invisalign and implant placement and restoration. Dr. Alfonso is a member of the American Dental Association and the Miami Dade Dental Society. He is fluent in both English and Spanish. 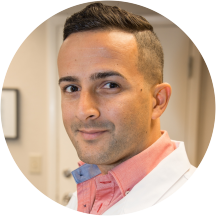 Dr. Alfonso earned his bachelor’s in biology at Florida International University in Miami. He later studied dentistry at the University of Florida. Patients trust Dr. Alfonso to provide a range of dental services. Some of these include routine dental cleanings, dental emergencies, teeth whitening, wisdom tooth consultations, root canals, and many others. Dr. Alfonso has provided oral hygiene instruction to migrant workers in area plantations and has been active in charity fundraisers. I love it. Great doctor and staff !!!!! I was very impressed of how nice and professionals the staff and Doctor was. Great experience starting with the receptionist, hygenist, and the dentist. Was able to fill a lost filling and did a better job than the person who originally put it in. Thank you Dr. Alfonso and Staff! Great service, will definitely keep coming here ???? The office is decorated nicely. The staff are super nice and professional. Wait time was minimal. Doctor has great bedside manner. I highly recommend. Que es un estupendo Estomatologo. Excellent !!! he is working on a crown and everything seems to be going good. Very nice atmosphere, I will definitely recommend him to all my friend!! They were very professional and friendly as well. The place it's nice and clean. I had a great experience at Dr Alfonso office!!! It was phenomenal! My daughter has Autism and they really knew how to make her feel at ease. It was great. Very professional and sweet at the same time. Creo q se lo recomendaría y principalmente las asistentes q me realizaron rayos x y la limpieza bucal. Tiene un buen trato. Everyone in the office is really nice and professional. The office is clean and I was seen really quickly once I arrived. The dentist and staff were knowledgable and answered all my questions in detail. Definetly recomendable! He's very personable and thorough. Very professional, took time to explain all the procedures that I need. Fue de lo mejor, un ambiente muy alegre y responsable a la misma vez. Trabajan con profesionalismo y te hacen sentir como familia. Amazing dentist. Already recommended Dr. Alfonso to all my family. Doctor and faculty are great. This was awesome, waiting room smells delicious staff was supper cordial. The Dr was great, fixed my problem super quickly and he has a very light hand, I've always gone to my uncle and cousin because they're both dentists for anythingI need, but I'm away from home now. The doctor and staff made me feel super comfortable and like I said, I didn't feel a thing. Two thumbs up and totally recommend it. Was amazing got to have the procedure I needed same day of my first visit with there office. Great staff and doctor. Defiantly considering being a regular patient. Dr. Alfonso was great! I got great advice along with service. Definitely recommend. I just wish that they would have tried to work with my daughter alittle more to calm her down instead of just saying she has to go to a specialist who will put her to sleep for treatment. Staff was friendly and timely and the doctor was a cool guy that listens and gives advice. It was a great first experience. Excellent office and staff. Everyone was super nice and helpful, even though we were a little late. Love this place!